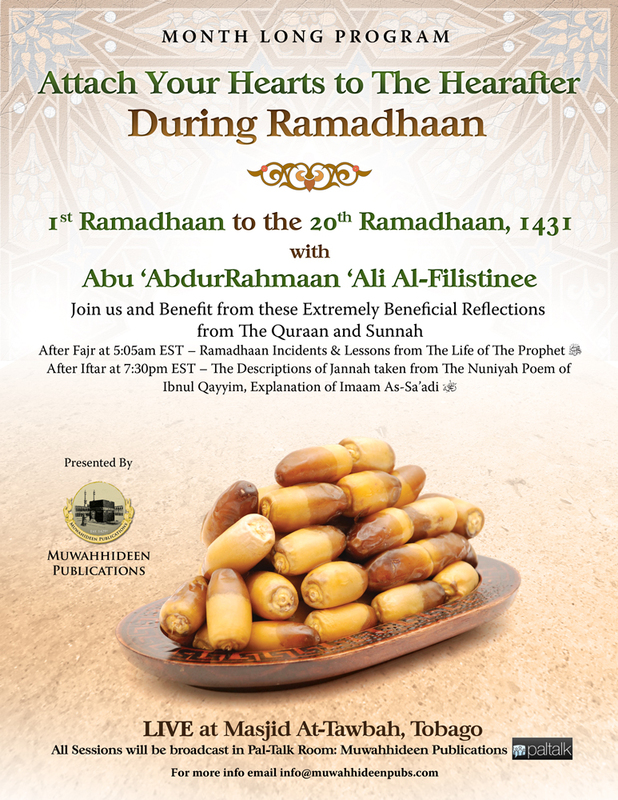 " "Attach your Hearts to The Hearafter During Ramadhaan" with Abu 'AbdurRahmaan 'Ali Al-Filistinee (former Imaam of two masaajid in New York and Student of Knowledge well known to the Scholars of Yemen) has already began to deliver these reminders from two very monumental books by Shaykh ul Islaam Ibnul Qayyim Al-Jawziyyah (rahimahullaah). Every morning after fajr, there is a small excerpt from the Seerah of The Prophet (salAllaahu 'alayhi wa Salam) taken from Za'ad al Ma'ad (Provisions for The Hereafter). This session serves as food for thought for the muslim to ponder as he begins his fasting day. Then after the muslim breaks his fast, there is the night session where a few lines of poetry are read describing Paradise taken from the beautiful poem, The Nuniyyah of Ibn ul Qayyim, explained by Imaam As-Sa'adi and Shaykh Uthaymeen (rahimahumuullah). The few sessions that have already begun, have indeed moved the hearts of the muslims here in Tobago, and I firmly believe these reminder and reflections will benefit all those who tune in online as well. Please see the flyer for full details inshaaAllaah"
from the Morning Halaqah on Seerah with ‘Ali Al-Filistinee taken from Ibn ul Qayyim’s Za’ad al Ma’ad : “When The Prophet (salAllaahu ‘alayhi wa Salaam) met Adam (‘alayhi salam) in the first heaven, he was shown all of the people of Jannah on the right side of Adam and all the people of jahanam on the left side…. REFLECT ON WHICH SIDE YOU WERE ON . From the Morning Session with ‘Ali Al-Filistinee taken from Ibn ul Qayyim’s book, Haadi Al Arwaah: “Allaah gave Firawn 9 Chances until he walked into the hellfire with his own two feet, and firawn is just an example of what transpires between people and their lord every day, and Allaah continues to give them chance after chance and they continue to turn their backs on Allaah. So The Prophet (salAllaahu ‘alayhi wa Salaam) mentioned everybody has two places one in paradise and one in the hellfire and he also said in the narration in Ibn Majah’s Sunan that if a person enters jahanam and he is to remain there the people of Jannah inherit his place in Jannah, and vice versa, so Allaah gives the son of Adam many chances….